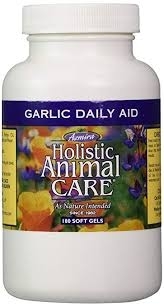 Azmira Holistic Animal Care Garlic Daily Aid supplement contains all-natural ingredientsto help support the skin, liver, immune system, and digestive functions. 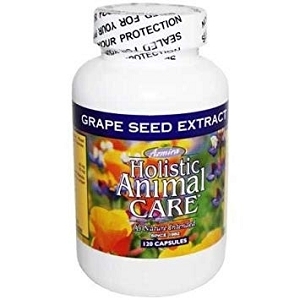 Azmira Holistic Animal Care Garlic Daily Aid supplement contains all-natural ingredients to help support the skin, liver, immune system, and digestive functions. Our pearls contain the strongest allicin content (1,000mg) of only the freshest, pesticide-free garlic, combined with 500mg of parsley extract. Considered by veterinarians to target circulation, digestion, and nerves. May also purge toxins, stimulate the lymphatic system, and immune system. Garlic Oil Concentrate equivalent to 1000mg of whole garlic cloves. Parsley oil concentrate equivalent to 500mg of whole dried parsley. Suspended in a base of pure soybean oil. Capsule is gelatin and glycerin. Soybean Oil, Gelatin, Glycerin, Water, and Lecithin. 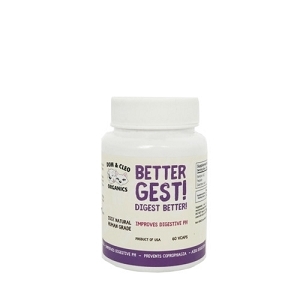 Cats and small dogs give 1 to 2 gel capsules per day. Medium to large dogs give 2 to 4 gel caps per day. 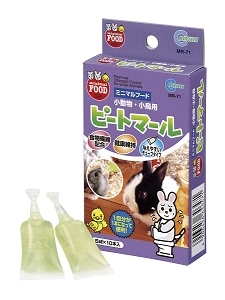 Feed orally or puncture and mix into meals or liquids. It is best to divide the daily dose into each feeding for optimum results.